I may be a little late to the party on this as the wild rose season in Nova Scotia is quickly coming to an end. But if you are lucky you can still find them flowering alongside roadways and in abandoned fields. They do sometimes tend to have a secondary burst of bloom. In fact, I saw some in flower yesterday. 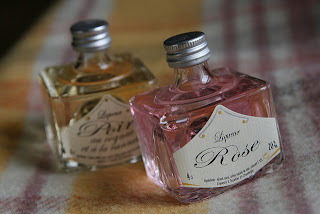 Rose liqueur is sold commercially if you can find it. We have three main types of “pink” wild roses in North America. They are all quite similar (5 petaled) and are very thorny, so be careful when harvesting petals. I doubt you would need gloves, but care should be taken. 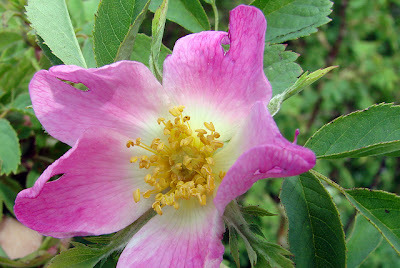 Rosa acicularis, the common wild rose, grows in Asia, Europe, and North America. Rosa arkansana, or wild prairie rose, grows only in central North America. Rosa virginiana is native to the United States only. All roses are edible, but the flavour is more pronounced in darker varieties. The taste of rose petals can also vary due to soil conditions. My suggestion is to smell the rose. If it’s nice and strong it will be suitable for liqueur. Fainter smelling roses will make a less pronounced flavour. Rose petals have many uses including rose syrups, jellies, compound butters and sweet spreads. If you look you can find a thousand uses that are not culinary as well. If you can’t find wild roses in bloom worry not – use rosa rugosa. They are a very common ornamental garden shrub that has been grown in North America for centuries. They bloom from June through September. Rosa rugosa bloom in colour from very dark pink through to white and can be single or multi petaled. 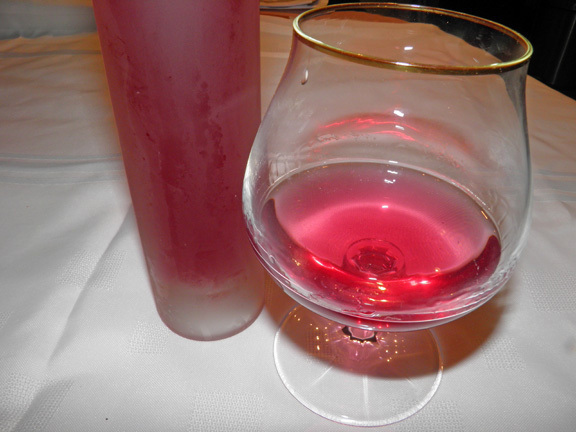 If you choose darker petals your liqueur will be correspondingly darker pink. You can use white, but your liqueur would have nearly no colour. Rosa rugosa hips are a favourite for making jelly, as they are much larger than wild rise hips so harvesting enough for a recipe is faster. Floral liqueurs are fantastic in mixed drinks. They add an aroma that you just can’t find in any other types of liqueur. Earlier I posted a recipe for lavender liqueur that is amazing mixed with tequila and lime. That drink, oddly enough, is called a desert rose. I would suggest that rose liqueur would be best with a less flavoursome alcohol. Strained Rugosa petals for 1/2 a recipe. Final result 1.5 cups. If you wish, you could dry rose petals in the oven and then store to make liqueur at another time. Simply arrange on pans and place in a low oven. Make sure you put a piece of parchment paper in the pan first so the petals don't stick as they dry. Check at 10 minute intervals and turn until well dried. Your kitchen will smell wonderful. Important: Do not use roses purchased for bouquets because they are covered in pesticides. Use only rose petals you can guarantee are pesticide free. Note: Harvest rose petals in the morning after they are dry from any dew or moisture. Dampness on the petals may introduce mould which isn’t a good thing in liqueur. If you have any worries, dry them in the oven as above. This smells like if you had your nose in a rose. Bring the sugar and water to a boil in a saucepan and let simmer for 5 minutes. Remove the yellow/white tips on the rose petals where they join the flower ovary (what will become the hip). The white bit is bitter. Lightly crush the petals in a sealable container or jar. Place the container in a dark spot for two days, shaking occasionally as you walk by. 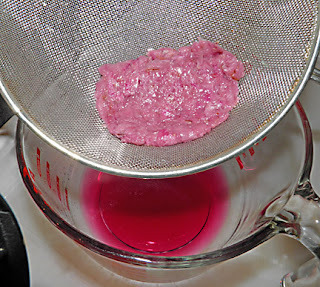 After two days the liquid will be pink. It probably will happen much sooner. Mine turned pink within 3 hours. 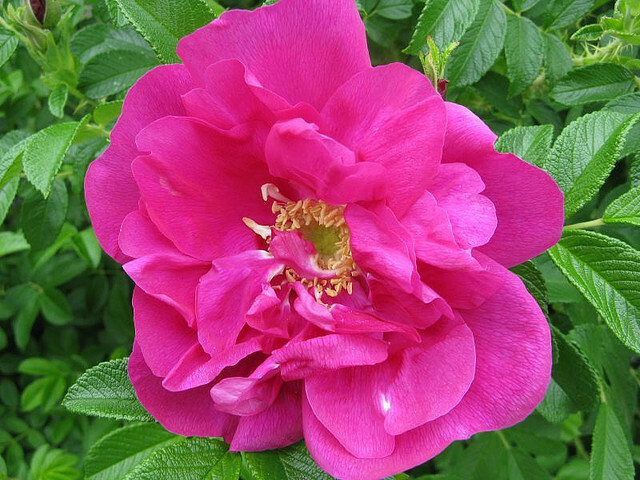 The rugosa petals I used are a darker colour than wild roses so my infusion was a darker pink. Combine with the liquor and bottle.